Even the gorillas in Israel keep kosher for Passover! At least the ones at the Safari Park Zoo in Ramat Gan near Tel Aviv, do. 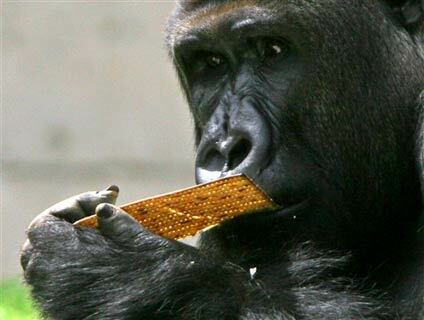 Since observant handlers cannot touch any leavened products during the weeklong Passover holiday (which will begin on Saturday), zookeepers have begun cleaning the premises of bread-related products and since Tuesday, have been feeding the gorillas -- along with all the other animals at the zoo -- a matzo breakfast. According Turkel, the constipation-causing crackers are not healthy for the animals, if ingested in excess. "If they eat too much it does cause stomach problems," she says, explaining that the gorillas aren't permitted to eat more than one or two matzos per day. "We hope that our public this week will not be feeding their own matzo to the animals."